This read-only area displays information about the selected segments that will be merged by this command. This read-only area displays the full path to the active folder that contains the source file segments to be merged. The new name or mask to rename the destination file(s) to. If this area is empty, or contains the *. * mask, no renaming occurs. Note that the three-digit numeric extension that was appended to the names of the segments will be removed from the name of the merged file automatically. 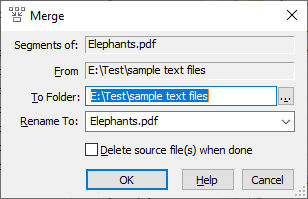 If this option is checked, the original file segments would be deleted after they have been merged into the file.